Scientists at the University of California, San Diego School of Medicine have found that mice with early lung cancer lesions that were repeatedly exposed to tobacco smoke developed larger tumors – and developed tumors more quickly – than unexposed animals. The key contributing factor was lung tissue inflammation. The results of their study, published January 19 in the journal Cancer Cell, provide definitive evidence for the role of lung inflammation brought on by chronic exposure to tobacco smoke in promoting lung cancer growth. The findings also establish new lung cancer models, provide insights into both the development and growth of lung cancer, and suggest the possibility of using anti-inflammatory agents to prevent or slow lung cancer progression, said Michael Karin, PhD, Distinguished Professor of Pharmacology and Pathology at the UC San Diego School of Medicine, who led the work. “We’ve shown for the first time that tobacco smoke is a tumor promoter – not only a tumor initiator – and that it works through inflammation,” said Karin, director of the Laboratory of Gene Regulation and Signal Transduction and a member of the Moores UCSD Cancer Center. “Other particulate materials, such as fine silicon dust, asbestos and coal dust, may promote lung cancer development through similar mechanisms. Lung cancer killed nearly 160,000 Americans in 2009, according to the American Cancer Society, making it the leading cause of cancer death in both men and women. It’s well known that tobacco smoke can cause cancer-inducing mutations and other types of lung disease, as well as pulmonary inflammation. Karin’s team wanted to know whether tobacco smoke could actively promote tumor growth once the cancerous process began and, if so, whether the tumor-promoting ability of tobacco smoke was due to inflammation. 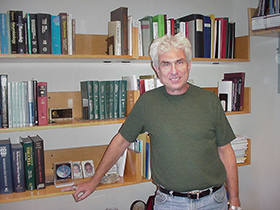 Karin and his group initiated lung tumors in mice, either by giving them a chemical carcinogen or by introducing a mutated gene, KRAS, into their genome. The mice were then intermittently exposed to tobacco smoke. The researchers found that exposure to smoke enhanced tumor formation, causing larger tumors that grew more quickly than those in mice that were not exposed. To determine a smoke-inflammation relationship, they inactivated nuclear factor kappa B (NF-κB) – a transcription factor known to be a common link between inflammation and cancer – in immune cells called macrophages and neutrophils, and found that this inhibited smoke-promoted tumor development in both chemically and genetically induced lung cancers in mice. Inactivation of NF-κB in macrophages and neutrophils also prevented smoke-induced lung inflammation. Short-term tobacco smoke exposure in mice may turn on certain biochemical signals – a pair of “signaling pathways” called IKKβ and JNK. This, in turn, ramps up the production of inflammatory substances, promoting tumor growth, Karin said. In addition to providing a more complete explanation for the cancer-causing ability of tobacco smoke, this work suggests new avenues for lung cancer prevention and treatment. “If scientists can look in lung cancer tumor tissue samples and see that inflammation markers – such as NF-κB, IL-6 and TNF, which we found in mice – are also present in human lung cancer, we can then build a strong case for the use of anti-inflammatory drugs to treat patients who have been diagnosed in the early stage of lung cancer,” said contributor David H. Broide, MD, UCSD Professor of Medicine. Additional contributors include Hiroyuki Takahashi, UC San Diego School of Medicine and the University of Tokyo Hospital; and Hisanobu Ogata and Reiko Nishigaki, UC San Diego School of Medicine. This study was funded by grants from the National Institutes of Health, including the Superfund Research Program and Tobacco-Related Disease Research Program, and the Japanese Respiratory Society and Kanzawa Medical Research Foundation. Karin is an American Cancer Society Research Professor.